The first time you walk into the International Festival Tasting Room can be intimidating, with 175 wineries pouring 3 or more wines each, you have at least 525 wines to try. But over time, you become a wine tasting veteran like me, setting up a strategy, checking out the background of some wineries you may not have heard of before, and go into the fray. With my pre-tasting planning, I was able to visit specific winery tables, and leave time for me to “discover” new wineries. It’s always fun to have some spontaneous component to anything you do; at least it is for me. In my previous article on my wine picks, I outlined the wines of California I really enjoyed at the Vancouver International Wine Festival. In this article, I’m covering the rest of the world; red and white. I didn’t cover any BC wineries as I can visit them, and attend other tastings throughout the year, so the absence of BC wines in my list below is not because I couldn’t find any wines. There were many, but the rest of the world had my ear this evening. Enjoy my picks! Bodega Catena Zapata Winery, Alta Chardonnay, 2010, Argentina. This winery is a top quality producer out of the Mendoza region of Argentina. If you have never tried their wines, I can highly recommend them. 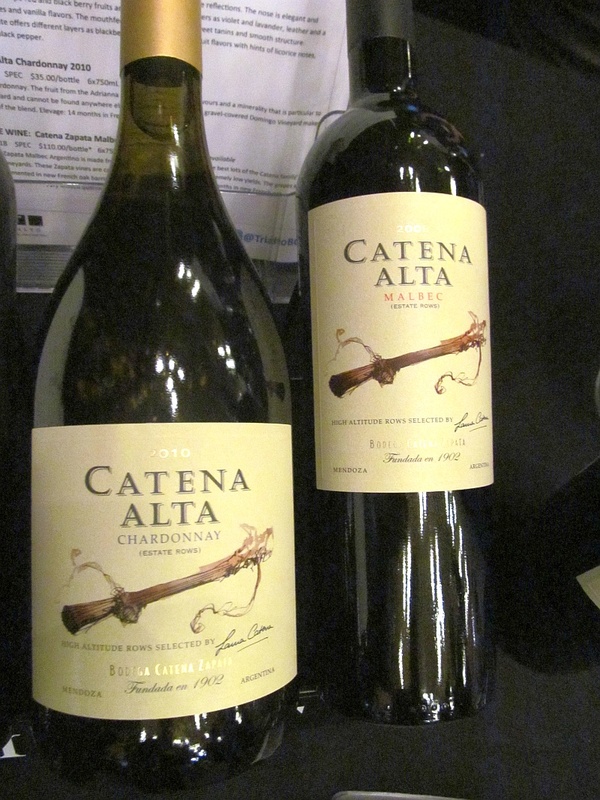 Catena Alta is an assemblage of historical rows within the Catena family Estate vineyards. Whole clusters are pressed, and then 100% fermented in 225-500 L French oak barrels with natural yeasts at low temperatures. The wines are then aged for 12-16 months in French oak, and 70% undergoes malolactic fermentation. This wine had a light citrus/lemon and oak aromas. Medium body, with light citrus and vanilla flavours, followed by minerality and pear on the mid-palate. Bodega Luigi Bosca, Finca Les Nobles Chardonnay, 2011, Argentina. Luigi Bosca is the oldest family-owned winery in Argentina, carrying over a century of wine making tradition. This chardonnay had light lees, lemon and vanilla aromas in the glass. Medium plus body, round and soft, with light tropical fruit and vanilla flavours and some sweet spices on the finish. An elegant wine. Stoneleigh Rapaura Series Chardonnay, 2012, Marlborough, New Zealand. New Zealand is well-known for their Pinot Noir and Sauvignon Blanc, but also produce other very good wines. This Chardonnay is a nice example. Elegant restrained stone fruit nose. Medium body, dry, with medium plus acidity. Citrus, stone fruit and peach fruit flavours, together with light spice and a herbal tinge. An elegant wine. 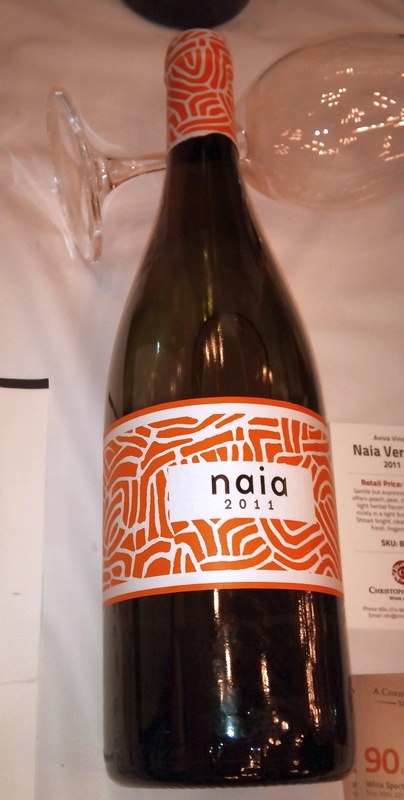 Aviva Vino, Naia, 2011, Spain ($21.99 SPEC). This white wine is made from the Verdejo grape. Nice peachy nose. Medium minus body, round and soft in your mouth with tasty stone fruit flavours. This wine was one of my pleasant surprises! Bodegas Jorge Ordonez Botani, 2011, Spain. This is another of my pleasant surprises. This white wine is made from the dry Muscat grape, or in Spain is known as Moscatel Seco. Beautiful orange and flower aromas in the glass. Light body, soft and light mouthfeel. Off dry with flavours of oranges and other citrus fruits. King Estate Signature Pinot Gris, 2011, Willamette Valley, Oregon. Light stone fruit nose. Medium body, dry with medium acidity. Stone fruit and lychee on the palate along with some nice minerality. Very tasty. Charles Smith Wines, Eve Chardonnay, 2011, Columbia Valley, Washington. Charles Smith is known as the “rock star” of Washington state, with bold wines and packaging. The labels have very expressive, very contrasty black and white graphics and text. The Eve Chardonnay had lots of stone fruit and citrus aromas. Medium body, quite round with tasty peach and vanilla flavours. Medium acidity that left your mouth watering on the finish. Brumont Vineyards, Chateau Montus Red, 2007, Gascony, France. This region of France uses the grape varieties of Tannat, Petit Courbu, and Petit Manseng. This particular wine is a blend of 80% Tannat and 20% Cabernet Sauvignon. It was dark, blackish garnet in the glass, and had a unique aroma of bbq’d beef. Full body, dry with ripe cherries and black fruit flavour, and some cedar on the mid palate. Medium tannins with a dry finish. Very nice. 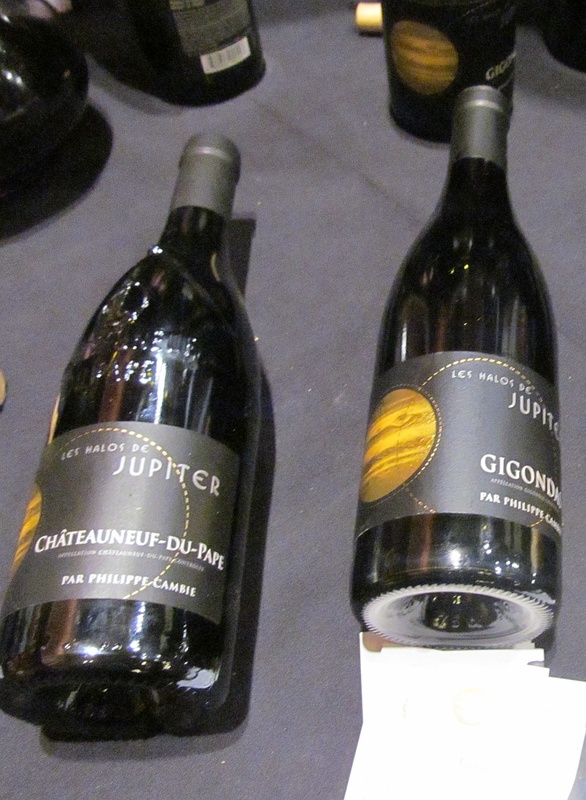 Les Halos de Jupiter, Cotes du Rhone, 2010, Rhone Valley, France. Dark garnet in colour with a nice cherry nose. I felt like this wine really showed a sense of place. Medium plus body, dry, with higher acidity, and pepper on the tip of your tongue. Ripe black fruit, cherry, and cassis flavours. Famille Perrin, Perrin Les Christins Vacqueyras, 2010, Rhone Valley, France. This wine had a “serious” cassis nose. It wanted you to concentrate on it. Dry, medium body with ripe cherries and cassis flavours, and a hint of capsicum. Medium plus tannins. Fontodi, Vigna Del Sorbo Chianti Classico, 2008, Tuscany, Italy. This winery, located in the heart of the Chianti Classico region, is a certified organic estate. This wine had nice aromas of cherry and oak. Light body, red cherries and red apple flavours. Very drying tannins and needs some time to age. Rocca Delle Macie, Chianti Classico Riserva DOCG, 2007, Tuscany, Italy. Nice light nose with cherry and oak aroma. Medium body, soft mouth feel, with cherries and some eucalptus and oak flavours. Stoneleigh Rapaura Series Pinot Noir, 2011, Marlborough, New Zealand. Matchsticks and cherries on the nose. Light body, raspberries, cherries and red currant flavours with vanilla in the back. Very good. Whitehaven Winery, Marlborough Pinot Noir, 2011, New Zealand. Light translucent garnet in the glass. Bright red cherry nose. Light body, dry, with soft tannins. Some herbaceousness on the palate, but primarily cherry flavour. Whitehaven Winery, Greg Pinot Noir, 2010, Marlborough, New Zealand. This Pinot Noir is a tribute by the founder, Sue White, to her deceased husband, Greg. This is a more intense Pinot in comparison to the other Pinot I recommended. This one is medium translucent garnet in colour, with a dark cherry nose. Medium plus body, round and dry on the palate with medium tannins. Cherries, vanilla, and some mintiness/ecualypt flavours in your mouth. Long length. Jose Maria Da Fonseca, Periquita Superyor, 2008, Portugal ($44.95). Portugal is one of my wine secrets. They produce some fantastic red wines, at exceptionally reasonable prices. I really like this wine maker, who produces wines at an entry level $17 up to $45 in our BC market. This wine is produced using a native grape called Castelão in the past, but now known as Periquita. Periquita Superyor is a super-premium wine from their old vineyards. The wine matured 14 months in new French oak barrels. Opaque ruby in the glass, with chocolate, cassis, and dark fruit aromas. Full body, plush mouthfeel, medium tannins with lots of ripe dark fruit flavours. Excellent. Jose Maria Da Fonseca, Periquita Reserva, 2009, Portugal($17.99). Deep ruby colour. Lots of cassis and ripe raspberry aromas. Round and soft in your mouth with medium acidity. Beautiful fruit flavours of cherry and cassis, with some eucalypt too. Boekenhoutskloof Winery, Syrah, 2010, South Africa. BHK is a premium producer out of South Africa. This is a very good example of Syrah. Nice aromas of blueberries, vanilla and mint. Medium body, light mouthfeel, with dark fruit flavours. I hope you enjoy this cross section of wines I’ve brought to you. 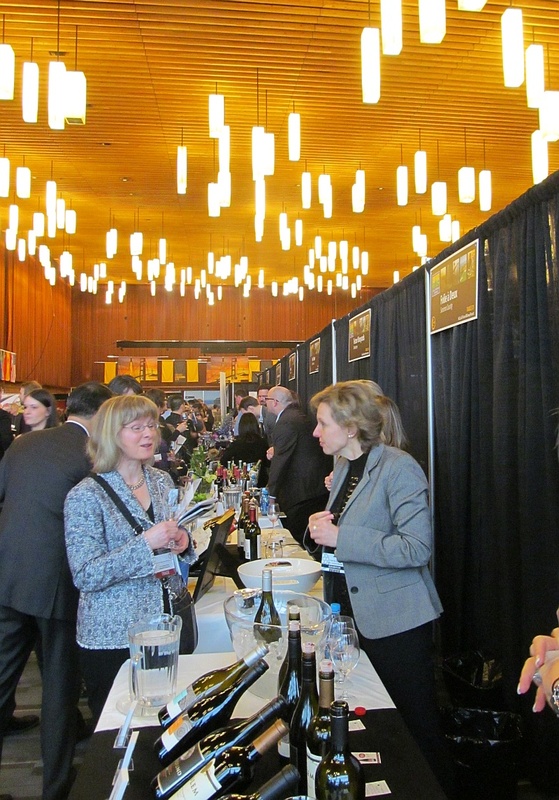 If you attended the Vancouver International Wine Festival and you found a gem that you would like to share, please post a comment here. Thanks and enjoy!